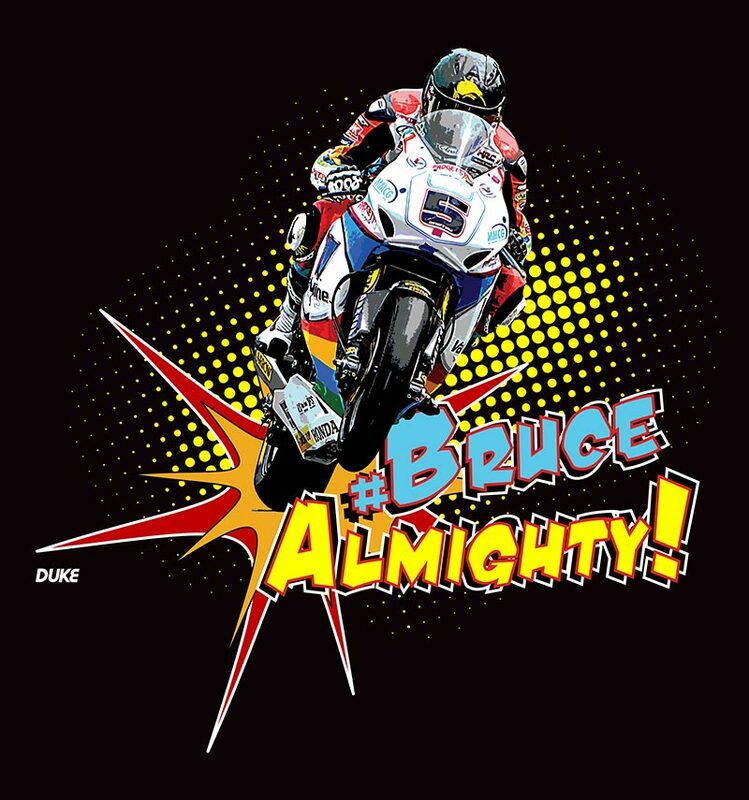 Show your support for Bruce Almighty with this excellent new T-shirt from Duke. New Zealand's most successful TT rider, Bruce decided he wanted to race on the Island after watching Mike Hailwood make his return in 1978. The 'Flying Kiwi' has overcome many trials and tribulations but his quiet and determined style has seen Bruce clock up ten wins to date. Some of the highlights include taking Triumph's first win in over twenty years (2003 Junior TT, Valmoto Triumph Daytona), winning the Production 1000/Superstock race four years in a row ('04, '05, '06 & '07) and being the first rider to lap in excess of 132mph in race conditions (2014 Superbike TT ). 2015 saw the popular rider achieve his dream of winning the Superbike TT - he's now won a race in each of the main solo classes he's entered. Away from the TT the Wellington native has achieved an almost unbelievable record of finishing on a podium at every international road race meeting he has contested since 2002. He holds the lap record at Dundrod - 133.977mph - which also makes him the fastest road racer in the world! 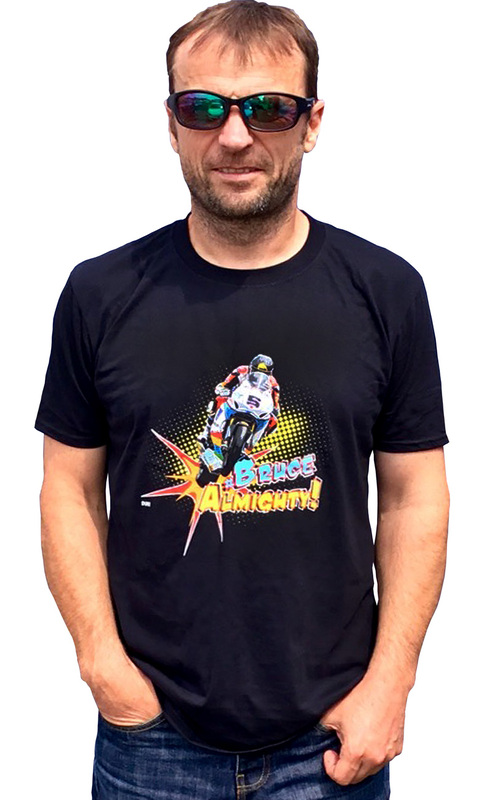 His enigmatic style and trademark duvet has earned Bruce Almighty legions of fans - and now they can show their support with this excellent Bruce Almighty T-shirt, approved by the man himself. 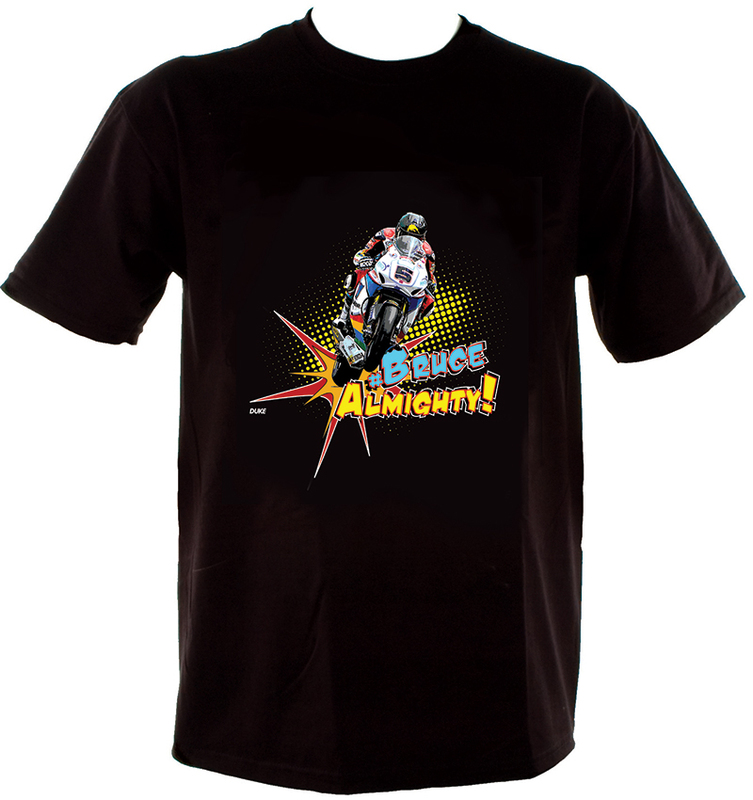 For every T-shirt sold we'll be making a donation to a charity of Bruce's choosing.